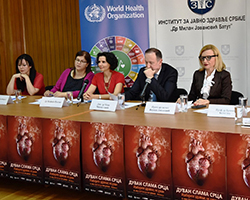 Opening her statement with the words “Don’t break your heart”, WHO Representative in Serbia, Dr Zsofia Pusztai, addressed the media on 31 May 2018, on the occasion of World No Tobacco Day. She warned of the adverse effects of smoking and tobacco use and the related risks of cardiovascular diseases (CVDs), the world’s leading cause of death. The event was organized at the Institute of Public Health of Serbia, with the joint participation of Dr Meho Mahmutovic, State Secretary at the Ministry of Health; Dr Verica Jovanovic, Director of the Institute of Public Health; Dr Branko Beleslin, Head of the National Association of Cardiologists; Dr Biljana Kilibarda, Head of the Office for Prevention of Tobacco Use at the Institute of Public Health; and Dr Zsofia Pusztai. Highlighting the risks of heart disease and stroke attributable to tobacco smoking, Dr Pusztai also pointed to the harmful use of e-cigarettes and to the health consequences of exposure to second-hand smoke. She called on governments to contribute to the prevention of CVDs through changes of legislation and enforcement of the WHO recommended measures for tobacco control. These include tax increases on tobacco products, graphic warnings on cigarette packs, bans on tobacco advertising, smoking bans in public and at the workplace, and comprehensive cessation services to assist tobacco users to quit. Enforcement of all of these measures would reduce the risk of CVDs within a period of only 5 years. According to the latest research conducted in Serbia in 2017, by the Office for Prevention of Tobacco Use, smoking prevalence has remained at the same level as in previous years. Compared to 2016, the number of smokers who have seriously considered quitting increased from 19% to 25%. Strong smoking habits prevent the majority of smokers (85%) from actually stopping, while 15% state that the social impact is the reason that prevents them from quitting, of whom most belong to the youngest age group (18–29 years). Most Serbian citizens (84%) agree that smokers should be mindful of where they smoke so as not to endanger the health of other people. A large percentage of the population of Serbia is exposed to tobacco smoke: 39% of employees in the workplace, 62% in their own household and 66% of those who visit restaurant facilities. Almost every other inhabitant is exposed to tobacco smoke regardless of the location. Based on the same research, Serbian citizens would, in a large percentage, support legislation that would protect children from exposure to tobacco smoke: 80% think smoking should be prohibited in the car in the presence of minors, 78% would support a ban on smoking in playgrounds and 53% in outdoor sports facilities.